Bed bugs are haematophagous sucking insects, feeding exclusively on blood. 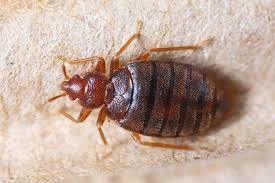 Bed bugs are insects that resemble an apple seed in appearance, are about ¼ inch long, do not jump and have no wings. Prior to feeding, they are flat but after feeding on blood they become bloated and turn dark red. During the day, these small, reddish-brown bugs hide in cracks and crevices of mattresses and foundation/box springs or within 15 feet of a bed. Then, at night, they come out of their hiding spaces to feed, usually on humans but also on other warm-blooded animals. These insects prefer darkness and tend to hide near the bed. They travel up to 20 feet in search of a human host. Hungry bed bugs may also feed during the daytime, especially if this is when the occupant normally sleeps. They are not only found in beds but they can fit anywhere their bodies can be hidden as there are as thin as a sheet of paper. Hotels with high occupancy turnover are especially vulnerable to infestation. Bed bugs mostly bite on the upper body, neck, arm, and shoulders but may be found on legs or ankles, too. They don’t transmit diseases, but they do bite and take blood. People can get secondary infections if they scratch their wounds. In some people, the itching is unbearable. However, a persistent belief about bed bugs is that they thrive only in dirty conditions. Bed bugs are not attracted to dirt and grime; they are attracted to warmth, blood and carbon dioxide. This means no hotel is truly exempt from a bed bug infestation or the resulting liability, no matter how high-end and reputable. Hotel guests around the country are reporting being bitten by bed bugs and are filing claims seeking compensation for insect bites and ruined hotel stays. Treating for an infestation can be time-consuming and costly. And, because the bed bugs lifecycle shows several stages of development. Female lays about 2-3 eggs a day in the same places where the bugs hide. The eggs are yellowish white in color about 1 mm long. Some 300 eggs can be found in cracks and crevices of buildings and furniture. The eggs usually hatch after 8-11 days. The newly hatched bed bug is pale yellow in color and resemble as an adult but is much smaller in size. There are 5 nymphal instars. This period commonly last for 5-8 weeks. The adult bed bug can live 6-9 months without food. The bed bug can withstand a long period of starvation up to 500 days. Under laboratory conditions, the adult may live up to 4 years. She said her office averages about one complaint a month, but not all of them are valid. Sometimes people are just not happy about their accommodations, she said. She added that the complaints come from all over, and sometimes even a “5-star” hotel can have a bed bug problem. Rappold explained that when she receives a complaint, she follows a procedure that includes visiting the facility where the complaint originated. If the report is substantiated, Rappold’s office requires professional pest control measures within two weeks and proof that such measures were conducted. As regional health program manager, Rappold handles complaints from all over the six counties of the San Luis Valley. She tracks trends in complaints and said they are seasonal, with this time of year and into the coming months being more active, especially as more tourists are visiting the area. Rappold said her office does not have regulatory authority over apartments but can require treatment actions at motels and hotels. Everyone is at risk for getting bed bugs. Their presence is not determined by the cleanliness of an area, Rappold shared. They are experts at hiding and go just about anywhere. They can go for long periods of time without feeding, which allows them to attach to items such as luggage and clothes, and travel home with guests. A Delta Airlines attendant has filed a lawsuit against the famed Westin Bonaventure Hotel, saying that she’d suffered bed bug bites during a stay there. According to the complaint, Chery checked into her room at the Bonaventure on November 5, 2014. She’d slept for about an hour when she began to feel “severe itching and burning all over her body, including on the right side of her face, her arms, her left index finger and down the side of her right thigh,” per the suit. She was bitten about six to seven times, and that she could see blood stains on her bed. The suit mentions that she’d taken photos of the bugs. A manager and hotel security came to confirm the presence of bed bugs and was given another room to stay in, according to the complaint. She dumped all her belongings, including her Delta uniform, immediately after the alleged incident, and that she’d suffered months of insomnia and anxiety because of it. On the bedbug registry a site for guests to self-report bed bugs, the Bonaventure had 23 reports posted between 2010 and 2015. Another bedbug lawsuit was filed at Los Angeles Superior Court in August; a family from the Bay Area claimed that they were bitten by bed bugs at the Grand Californian Hotel at Disneyland. Unfortunately, bed bugs aren’t exactly uncommon in the L.A. area. Earlier this year, pest control service Terminix released a ranking of the most bed bug-infested cities, and L.A. landed in the fourth spot, right after Cleveland, Ohio. Traditionally used pesticides have proved ineffective against bedbugs. These insects have started showing lower susceptibility towards commonly used insecticides. So what could be the preventive measure for bedbugs? Termirepel™ an anti-insect additive at C Tech Corporation product is an ideal solution for the prevention and control of bedbug infestation. The masterbatch of Termirepel™ can be incorporated in wires and cables which are used in domestic wiring. Termirepel™ liquid concentrate which can be mixed in paints and can be applied to damaged applications.While Termirepel™ lacquer can be used as a topical application which can be applied to furniture, walls, ceilings etc. Pests, considered as an age-old enemy of agriculture, continue to thwart the sector by destroying the crops. Though tiny, they are capable of large-scale destruction. Termites can cause agricultural damage due to their voracious appetite for cellulose and, in other parts of the world, other materials. The exact dollar amount of loss due to termite damage is unknown in the agricultural world. Agricultural damage can occur in several ways. First, the termite can i nfest the crop itself and limit the yield. Second, the termite can interfere with farming infrastructure such as by destroying poles that support fencing. Third, the termite can destroy containers used to ship agricultural products. On average the pests are known to cause 10-16% agricultural produce loss. The insects attack several agricultural and horticultural crops. 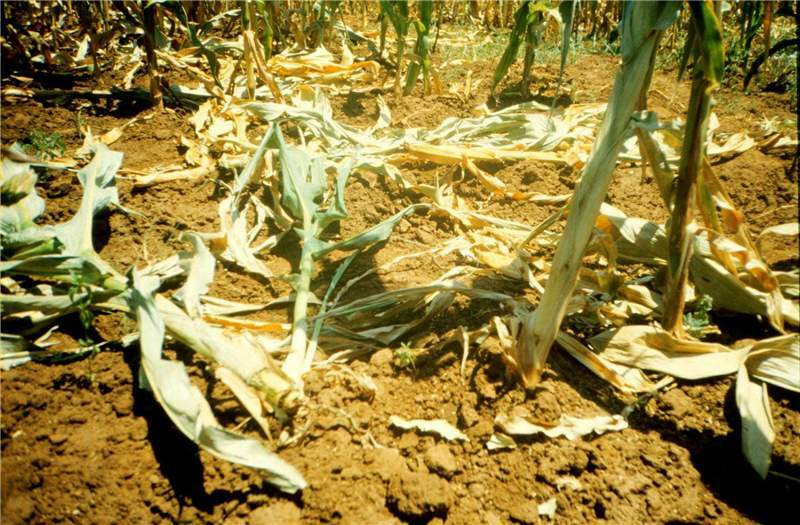 It is estimated that the loss accumulated due to damage to these crops may run to several millions of rupees per year. In North America, few crops are vulnerable to termites. However, termite species in other parts of the world may infest the actual crop and cause damage. Since termites are social insects and are in a colony, termite damage is generally concentrated and not widespread in a field. Locusts, for example, are not social and have no colonies, so when they attack a field it is in a quick and somewhat chaotic manner. Termites have been known to attack paper products including record keeping so the agribusiness is negatively affected. Packaging material has a long history of attack by termites. The crop-eating allium leaf miner is from Europe. Experts say the bug, which thrives on vegetables like onions, garlic, and leeks, was first found in the U.S. two years ago in Pennsylvania. Since then, it’s infested the Northeast destroying crops. It’s also made its way to the Hudson Valley. “First I’ve seen it in my fields ever was a few weeks ago. I thought it was a mini-termite,” says fourth generation black dirt onion farmer Chris Pavelski, of Pine Island. Ethan Grundbert, of the Cornell Cooperative Extension, says if the population continues to build like it has in Pennsylvania, it could be a serious issue Hudson Valley farmers are faced with the next few years. News 12 has learned that the bugs die off in the summer months but reappear in the fall. Currently, pesticides are still being tested. Farming and cattle rearing are their source of income. “Every family has at least two cattle. Their survival is a daily struggle. Every year, we spend Rs 15,000 to Rs 20,000 in buying grass,” former pradhan Padam Singh says. So, what ails Lambari? An RTI application filed by Hindustan Times to the district magistrate’s office shows that in 1994, 1998 and 2009, work plans to control termites were formulated by district officials. However, the higher administration refused funds for the plans. The agriculture department accepts that insecticides it provides to villagers have only been able to reduce termites in agricultural fields and have no effect on termites inside the buildings. 75% of the agricultural area was under termite attack. A work plan costing Rs 4.7 lakh was prepared. But funds were not granted. “Common pesticides become ineffective in Lambari because the population of termites is significantly high,” former vice-chancellor GBPUAT Prof BS Bisht, who commissioned the 2009 team, says. The Florida Department of Agriculture and Consumer Services have issued a Stop Work Order prohibiting Sunland Pest Control from conducting any fumigation at this time. This comes after a Palm City boy suffered brain damage after termite fumigation at his Palm City Home. “We are aware of the tragic and heartbreaking incident involving Peyton, and the Florida Department of Agriculture and Consumer Services is investigating Sunland Pest Control in collaboration with the EPA and the Department of Health,” the department said in a statement late Friday afternoon. Peyton McCaughey turned 10 Thursday at Miami Children’s Hospital, barely able to turn his head, unable to stand up or talk. His family said the boy has suffered brain damage after termite fumigation on their house.